Doutta Galla is fortunate to have three state of the art poly clay tennis courts. 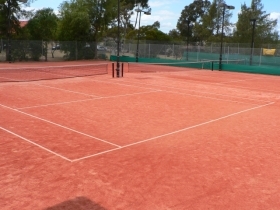 Poly Clay is an artificial clay surface designed to imitate the clay courts of Europe, without the high maintenance. Polyclay courts can be played immediately after rain, and often play better!